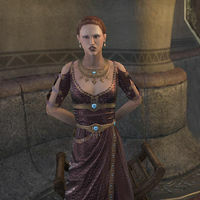 Valga Celatus is an Imperial working for the Gold Coast Trading Company who can be found in the Saint Olms Waistworks in Vivec City. She sits in the western part of the hallway outside the Tanners and Miners Hall. If you're not doing her related quest, Valga tells you to go away. "I don't have time to talk right now. I'm having a bit of a crisis at the moment." "Tell me you're here about my request. I can't afford to waste another minute." "About time! I was almost starting to think no one would come. A Nereid caused one of our ships to run aground. I need you to recover what you can, and dispose of the creature before it can cause any more damage—namely to my career." How did a Nereid wreck a ship? "Apparently it sang a little song and all of my "well respected" sailors just went belly up and ran the ship ashore. From what I can gather this isn't the first time it's happened either. Really, I've never heard of something so outlandish!" Can you tell me about the sailors protecting the Nereid? "Sailors, pirates, oh it has quite the little collection. Whoever doesn't drown ends up under its spell, including some of my own workers. We've made several attempts, but they cannot be reasoned with. Just make sure they don't get in your way." You seem pretty upset by all this. "You know, you go out into the world with big dreams. Like being successful, and worldly, and ridiculously wealthy. And then your first big shipment is destroyed by a singing Nereid and you really start to question things. Namely your career choices." "Please tell me you have good news." I defeated the Nereid and recovered these goods. "Finally, a competent worker! You'd be surprised how difficult those are to come by these days. You should sleep better knowing that creature won't be ruining anymore careers. And I'm sure the extra gold in your pocket doesn't hurt either." "I really do appreciate everything you've done. Perhaps my career isn't ruined after all."